On previous discs, Christian Poltéra has combined concertos with chamber works by composers such as Frank Martin and Arthur Honegger. The recipe proved highly successful, resulting in more rounded portraits of each composer, as well as of the performer himself: while Poltéra’s performance of Martin’s Cello Concerto was described in Gramophone as having ‘an inspirational intensity to compare with the celebrated Du Pré/Barbirolli recording of the Elgar Concerto’, the reviewer in Fanfare praised him for ‘playing with the kind of semi-arrogant, swashbuckling carefree attitude that suits Honnegger to a tee’. 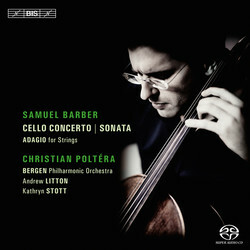 As he now proceeds to Samuel Barber – some twenty years younger than both Martin and Honegger – Poltéra opens his programme with the Cello Concerto, tailored especially for the Georgian-born cellist Raya Garbousova in 1945. The 25-minute long work is one of only three concertos by Barber, and is remarkable for the way in which he balances out the natural lyric expressiveness of his earlier music with a more urgent, acerbic style, highly rhythmic and intense. Christian Poltéra and his regular chamber-music partner Kathryn Stott gives a performance of the Sonata for Cello and Piano, composed while Barber was still a student, but brilliantly written for the two instruments.